What was once the Santa Ana Army Airbase during WWII is now a tract of approximately 850 ranch style homes built between 1961-1964. This area is the best kept secret in Costa Mesa. It has beautiful tree-lined streets with ample side walks for evening walks around the neighborhood. It borders one of the largest parks in the area, TeWinkle Park and Angel's Playground with an ADA-accessible play area, and John Hammet Sports Complex as well as Volcolm Skate Park, Costa Mesa Tennis Center and our own Bark Park. Homes in this neighborhood tend to be the best value and are often sought after as starter homes. From fixers to remodeled gems, you will find a little of everything. This community is part of the Newport Mesa Unified School District and has an elementary school within this neighborhood, Sonora Elementary, a California Title I Achieving School and a 2009 National Title I Distinguished School. The first magnet school in the school district is also located here, Davis Magnet School, which places an emphasis on science, math, and technology. The local junior high and high school is Costa Mesa which has a distinguished record in sports and academics. 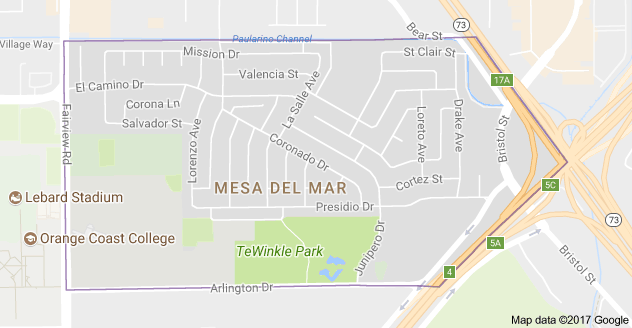 In Mesa Del Mar there is no homeowner’s association, however there is a very active volunteer neighborhood association, The Mesa Del Mar Homeowners Association. Homeowners are welcome to join this association which has a strong presence at city events.